Although guarded by armies of flying insects that chase down and sting potential thieves, honey, nature’s gold standard for sweetness, has lured humans to beehives for thousands of years. No one knows exactly when the thick liquid produced the first shock waves of pleasure and pain in a hominid, but one rock painting depicting two women collecting wild honey dates back at least eight thousand years to the Mesolithic period. Even in ancient times, people found multiple uses for honey—from an antiseptic to an embalming agent—and deemed it fit for their gods. While accompanying pharaohs in their tombs, honey also played a role in sacred Hebrew Temple offerings. Likewise, beeswax served as a sealant and glue and provided the foundation for all kinds of items, such as funeral masks, amulets, small statues, and covers for writing tablets. Over the ages, a high demand for honey and honeycomb has inspired many to gain control of production through beekeeping, or apiculture. Ancient relics document that the Chinese, Egyptians, Greeks, and Maya each improvised ways to domesticate bee colonies by attracting them to hives made of everyday materials: hollowed logs, pottery, wooden boxes, and straw baskets (or skeps). The Chinese, often accredited with originating the art of beekeeping, were choosy about the woods they used for their precisely configured hive boxes. Meanwhile, an elaborate ninth-century setup found in Israel’s Jordan Valley seemingly accommodated a hundred hives made of unbaked clay and straw. Throughout the Middle Ages, the monasteries and abbeys of Europe ran masterful beekeeping operations that yielded plentiful supplies of beeswax candles and alcoholic mead. Honeybees are indigenous to parts of Europe, Asia, and Africa, but not the Americas. The Maya, mentioned previously, kept a stingless bee of a different species. The Europeans first imported bees to the Western colonies for honey and crop pollination, and since then, numerous hybrids have resulted through intentional breeding and in nature. Whether feral or domesticated, bees are programmed to defend the colony. Humans, nevertheless, learned early on that they could quell a bee’s aggressiveness by blowing smoke into the hive. Scientists now understand that smoke not only masks the insect’s pheromones—chemicals that incite reactive behavior such as to attack because the colony is in danger—but it also triggers bees to feed on honey and conserve their energy in the event of a fire. Since a bee smoker poses no real harm, beekeepers (or apiarists) still use the age-old method to collect honey. Other beekeeping practices have changed significantly, both to the benefit and the detriment of honeybees. In the past, for instance, collecting honey typically entailed ripping the honeycomb apart, destroying eggs and larvae in the process, thereby terminating the colony. Fortunately, key scientific observations during the eighteenth and nineteenth centuries enlightened beekeepers to take a more ecological approach. A strong queen is constantly laying eggs,” says Amy Wright, owner of the Honey Hutch, a beekeeping business based in Destin, Florida. “She’ll live two and a half to three years, but if she’s not producing, the workers will either kill her or kick her out and replace her with a new queen. Deep insights about the hive’s construction, for instance, arose in the late 1800s from experiments conducted by Lorenzo Lorraine Langstroth, an American who studied the bee space—the tiny openings (one-quarter inch to three-eighths inch) that bees utilize in the hive as passageways. Working with a rectangular beehive made of wooden frames, he then tested his measurements. Langstroth hypothesized that if he placed each of the frames a bee-space distance apart from each other, the bees would build parallel honeycombs in line with each frame without filling in the areas between with wax. He was right! The bees kept those spaces open. Importantly, the little workers did not bind the separate frames together with wax, which meant that the beekeeper could gently lift a frame of honeycomb for inspection and even extract honey without harm. When finished, the beekeeper could replace the frame with the honeycomb intact for the bees to refill. Understanding the roles of honeybees in a colony has also helped beekeepers support healthy hives. In the late 1700s, Swiss scientist François Huber proved that only one queen lives in a hive, and she is the mother bee of all other members of the colony. In contrast, many drones (the male bees) periodically inseminate the queen at once so that she can lay eggs. Amy explains that only “queen cells” in the hive produce queen bees. “The workers feed the larvae in those cells a special royal jelly,” she says. When a new queen hatches, she must either take over the hive or leave and establish a new one. Often, the original queen will leave with more than half of her brood as soon as the hive becomes too congested. At that time, the bees swarm, meaning they gather on a tree limb or other object until scouts locate an ideal nesting place. In that case, the beekeeper would strive to capture the queen, which would deter the colony from flying off and building a wild nest. “We’ll also split a hive by pulling the queen when the population has expanded,” Amy says. Domestic or feral, in order to reign, a new honeybee queen must first win acceptance and then face ongoing pressure to produce. Her role, nevertheless, has advantages over her subjects. Worker bees not only wait on her, but also live to work over a relatively short life span. During the spring and summer, when the hive is busiest, worker bees and drones typically survive between six and eight weeks. “The drones exist only to inseminate the queen,” Amy informs. “When the queen is finished with them, the worker bees chase the males from the hive.” Drones cannot survive outside the colony, so the eviction is a death sentence. The worker bees, by the way, are all female. “Every worker has a job,” Amy says. In addition to feeding the hungry larvae, worker bees take care of the queen, build combs, forage for nectar and pollen, transform nectar into honey, guard and protect the hive, circulate fresh air through it, and more. “If you see a bee away from the hive,” Amy points out, “it’s probably focused on foraging, so just leave it alone. Don’t swat at it!” In most cases, the lone honeybee will attack only if threatened. I was living and working in North Carolina at the time, but when we learned that the hospital was using honey for wound care, it was suddenly obvious what I should be doing for a career. Thanks to Amy’s attentiveness and her dedicated dad’s assistance, the Honey Hutch, which launched in 2013, is currently home to an average of sixty hives, each of which accommodate between thirty and sixty thousand bees. They produce about five hundred gallons of honey annually in varieties like gallberry, wildflower, tupelo, and clover. Flavors vary from spring through summer, depending upon the flowers in bloom and the bees’ discretion regarding pollination. In addition to honey, the Honey Hutch sells handmade honeypots, and Amy is perfecting her own brand of lip balm and sunscreen. Tim’s honeybees stay busy pollinating a multitude of seasonal flowers on the 3,500-acre property—white and red clover, wild blackberry, black-eyed Susan, partridge pea, honeysuckle, and purple aster, to name a few. They are also responsible for Pursell Farms Wildflower Honey, a signature “homegrown” product that the resort’s guests can take home as a memento. To enhance the flavors of the polyfloral blends his bees concoct, Tim shares, “I run my honey through one strainer, forgoing the fine-grade strainer, in order to preserve some of the pollen.” Keeping a healthy share of the honey for the bees, he will have harvested about thirty gallons in 2014. Statistics show that about one-third of honeybee colonies around the world collapse each year. Leaving enough honey for the bees is one of the most significant ways to ensure the health and longevity of a colony. Unfortunately, many commercial beekeepers overharvest and then attempt to make up the loss by feeding their bees high-fructose corn syrup. While the sugar is a blend of ingredients found in nature, it’s not what bees naturally consume. Moreover, research indicates that the substance could trigger genes that cause honeybees to metabolize toxins, such as pesticides and herbicides, which are among a number of complex factors cited for a sharp decline in honeybee populations since the 1980s. Statistics show that about one-third of honeybee colonies around the world collapse each year. Along with unseen environmental contaminants, beekeepers are also witnessing an unprecedented increase in harmful parasites. Hive beetles, for example, defecate in the honey, causing it to ferment, and their larvae tunnel through combs, creating a path of destruction. Another hive killer, the varroa mite, feeds off the adult and larval honeybees’ blood. For those reasons and more, worker bees are disappearing from hives, a phenomenon referred to as colony collapse disorder. “If you have a healthy hive, the bees can take care of problems themselves,” contends Renee Savary, owner of Twin Oaks Farm in Bonifay, Florida, a town forty-five miles north of Panama City. Born in Switzerland, Renee moved to Florida for warm weather and established Twin Oaks Farm to produce organic food. “I got into farming because I was starting to suffer from a debilitating illness,” Renee says. “Through research, I figured out that food was making me sick. When I had a chance to buy this land, I wanted a farm that would be certified organic: 100 percent clean, meaning no contaminated soy, no GMOs, no chemicals. We produce artisan food—nothing to make you sick.” In addition to raising ducks, chickens, sheep, and hogs, Renee is a beekeeper with about sixteen hives. Renee asserts that the conventional farmer’s aim to generate the highest possible honey production at the lowest possible cost is destroying the honeybees and ironically, some of the farm’s most valuable workers. Multiple detriments generally stem from one bad practice, such as monoculture. “Bees are naturally inclined to pollinate a variety of flowers,” Renee explains, “but commercial beekeepers transport their hives thousands of miles across the country to pollinate single crops, and much of what they pollinate, like almonds, is heavily sprayed.” Remarkably, research shows that if farmers left a third of their acreage unplanted, allowing the natural vegetation to flourish so that bees could nest and forage, their profits could more than double. The manmade beehive presents another example of how excessive human intervention yields weaker returns. “I recently learned that at the turn of the twentieth century, people decided that a bigger bee would make more honey and more money,” says Renee. Like Amy and Tim, Renee helps her hives become established by refraining from collecting honey in a hive’s first year. She also stops harvesting in midsummer so that the bees can sustain themselves over the fall and winter. In return, her colonies are gradually increasing their output of a highly diverse wildflower honey. Without question, environmentally conscious farming and beekeeping are essential to the longevity of honeybees. 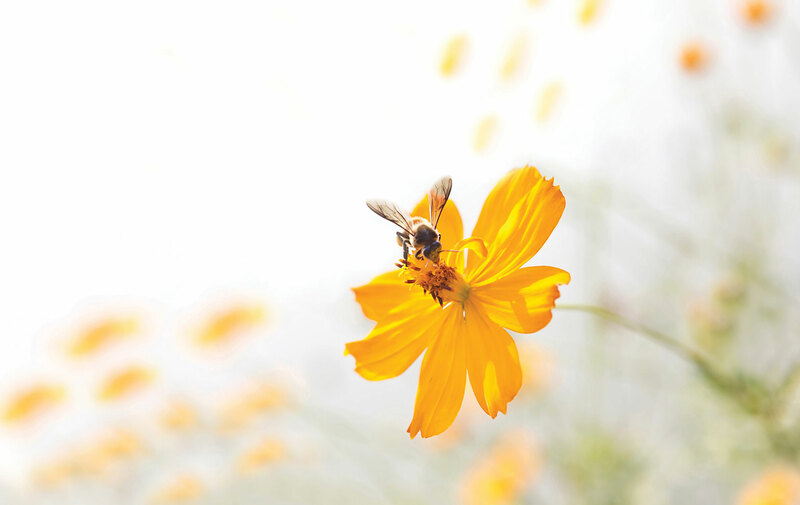 Consumers, in turn, help tremendously when they purchase honey from responsible sources. Individuals also benefit the honeybee simply by planting flowers. Of course, if backyard beekeeping is an option, that too could be explored, but other options also exist to try it out. Considering how hard honeybees have worked over thousands of years to the benefit of humans, taking a few steps to keep them alive and flourishing isn’t all that difficult and certainly seems wise. Honey Hutch and Twin Oaks products are available locally at the Seaside Farmers Market on Saturdays and at Raw and Juicy Organic Café and Juice Bar in Seaside, Florida.